And it’s not the first time it happens, either. Bananas you find in supermarkets the world over all belong to a cultivar called Cavendish. It’s the only variety that is suitable for extensive commercial crops and all plants are clones of one another (this is also due to the fact that the banana plant is a herb, not a tree; and while we’re at it, bananas are technically berries). But if you could go back to 1950 you would find a different type of banana. A much better one. Before it was wiped out by a fungus called the Panama disease, the world feasted on a lush banana cultivar called Gros Michel. It produced larger fruits that kept fresh for longer, and connoisseurs say they were tastier, too. But to be commercially viable, it suffered from the same problem as today’s plants: it had no genetic diversity. As soon as the disease started spreading, in Honduras in the 1920s, it was just a matter of time before all of the world’s banana plants were under attack. So when Gros Michel was about to go belly up, a new disease-resistant variety was found in Vietnam. It was the Cavendish. Cavendish bananas, which hang from the ‘tree’ upside down like all bananas, have to be encased in plastic bags covered with pesticides while growing. They also have a much shorter shelf life and need to be collected when completely green. They are then artificially ripened at their final destination by putting them in rooms filled with ethylene gas. Still, they represent one of the world’s largest commodities and they are probably the very first ‘fast food’: all bananas are pretty much identical wherever you go, just like Big Macs. Of course, you can still find locally produced Gros Michel bananas and tens of other varieties, mostly in South America. But now, the Cavendish is also under attack from a variant of the same disease that killed its predecessor. What will happen when it goes bust? Well, we do have the technical resources to tackle the problem in labs directly. New banana types are literally being grown in test tubes. 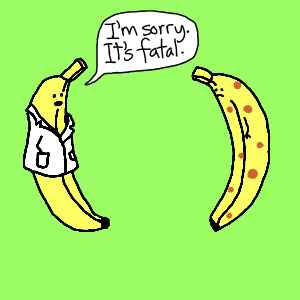 Which, for some people, might be scarier than losing the world’s most beloved fruit altogether.